I gave myself a birthday present this year... a day off from work! :) So yesterday, I had lots of time to cook. For lunch, I made myself a veggie pizza. 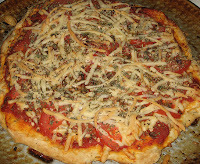 I love homemade pizza... so much better than commerical brands. This one was made with a store-brand dough, Barilla pasta sauce (acting as pizza sauce, since it was already open in the fridge), veggie pepperoni, veggie cheese, tomatoes, oregano, basil and some fresh thyme sprinkled on top. Deelish! 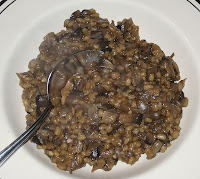 Monday evenings, I have dinner with my BF, so I tried a new recipe last night: Barley "Risotto" with Mushrooms. I found the recipe in the Weight Watchers Versatile Vegetarian cookbook. Twas good! My BF liked it too... he's a big mushroom fan, so this was right up his alley. :) I should also mention that this recipe was almost vegan, except for the tablespoon of parmesan cheese. So, with a vegan substitute for that, this would make a yummy meal for someone avoiding all animal products. And, I should mention that my awesome sister gave me Vegan with a Vengeance for my birthday this year... so look for some of those recipes on this blog in the future!